WEBCommentary(tm) - Allen West History Lesson re Killing of Usama bin Laden during Bararack Obama Presidency and Killing of Japan's Admiral Yamamoto in 1943 During Franklin Roosevelt Presidency. Allen West History Lesson re Killing of Usama bin Laden during Bararack Obama Presidency and Killing of Japan's Admiral Yamamoto in 1943 During Franklin Roosevelt Presidency. Suppose, on April 18, 1943, after American P-38's shot-down the Japanese warplane carrying Admiral Yamamoto, the mastermind of the Pearl Harbor attack, President Franklin D. Roosevelt were to have decleared "we have defeate the Empire of Japan." 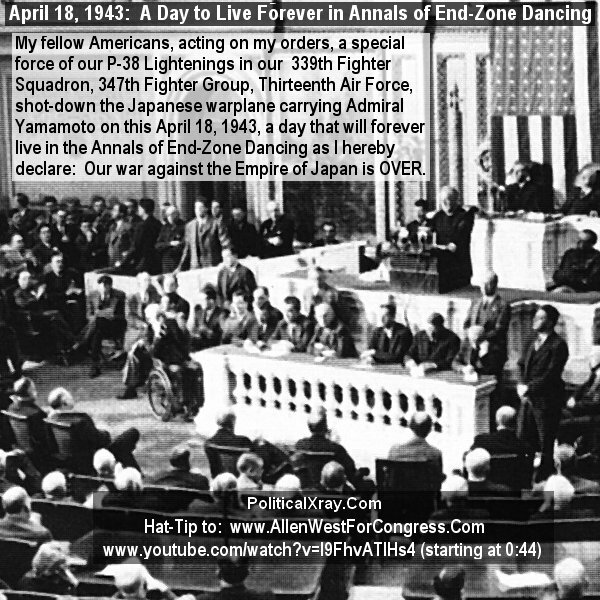 Would Roosevelt have said this: "My fellow Americans, acting on my orders, a special force of P-38 Lightenings in our 339th Fighter Squadron, 347th Fighter Group, Thirteenth Air Force, shot-down the Japanese warplane carrying Admiral Yamamoto on this April 18, 1943, a day that will forever live in the Annals of End-Zone Dancing as I hereby declare: Our war against the Empire of Japan is OVER." Allen West History Lesson re Killing of Usama bin Laden during Bararack Obama Presidency and Killing of Japan's Admiral Yamamoto in 1943 During Franklin Roosevelt Presidency-- Suppose, on April 18, 1943, President Franklin D.
"My fellow Americans, acting on my orders, a special force of P-38 Lightenings in our 339th Fighter Squadron, 347th Fighter Group, Thirteenth Air Force, shot-down the Japanese warplane carrying Admiral Yamamoto on this April 18, 1943, a day that will forever live in the Annals of End-Zone Dancing as I hereby declare: Our war against the Empire of Japan is OVER." President Barack Obama's 2012 campaign video on the one-year anniversary of the killing of Usama bin Laden (a.k.a. Osama bin Laden) touts his order for the Navy SEALS to kill bin Laden and implies Mitt Romney would not have issued such order, but the campaign video also deliberately failed to include the now-famous quotation of Usama's Last Words a.k.a. 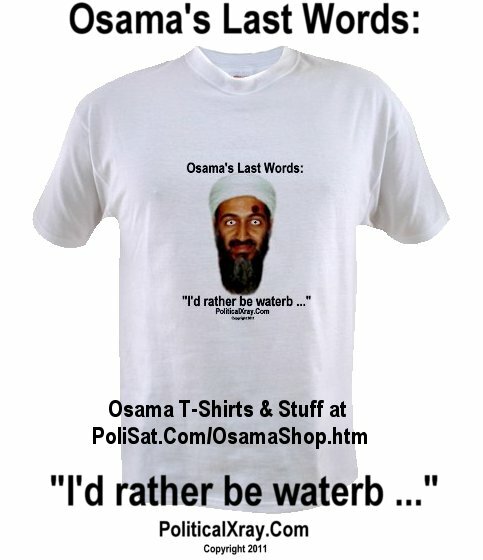 Osama's Last Words (as he saw a Navy SEAL taking aim at him): "I'd Rather be Waterboarded." Also not reported is that as the Navy SEAL pulled the trigger, he said (in response to Usama's Last Words): "Don't forget to explain to the 72 virgins that if it were not for Khalid Sheik Mohammed having been waterboarded (under supervision of Jose Rodriguez, Jr. by authorization from Bush 43), we would never have learned the clues that were essential to our finding you here tonight-- i.e., if Jose Rodriguez, Jr., were not to have passed the football, Obama would never have an opportunity to do an end-zone dance to celebrate your demise." 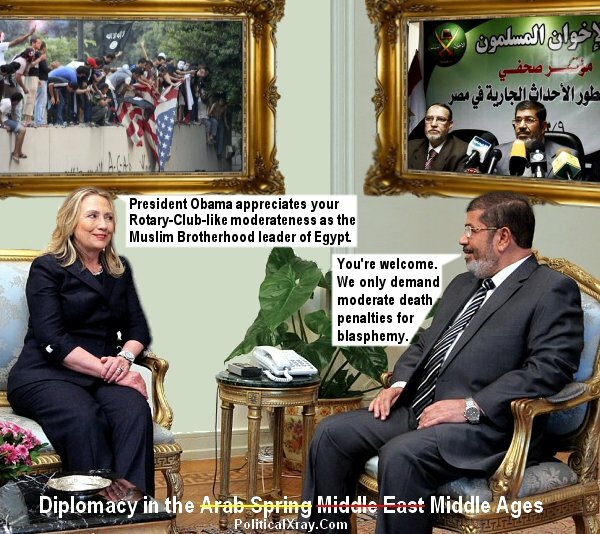 Secretary of State Hillary Clinton expresses President Obama's appreciation to Egypt's President Morsi for the Rotary-Club-Like Moderateness of his Muslim Brotherhood of Egypt in seeking only moderate death penalties for blasphemy. In the wake of Egypt's issuance of criminal arrest warrants against Americans in the United States who participated in making a movie insulting Islam, some (if not many) progressives (for two examples go here and here) rush to assert that the making of a movie expressing what is known to be deemed blasphemous by Muslims is the equivalent of "shouting 'fire' in a crowded theatre" rather than free speech protected by the First Amendment. 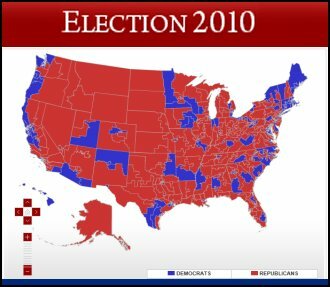 Clint Eastwood re Obama in Chair by PoliticalXray on Vimeo. Obarter 2012 by PoliticalXray on Vimeo. Everybody Needs A Mahdi from PoliticalXray on Vimeo.